Houzz conducted it's annual Kitchen Trends Survey for 2018 which revealed homeowners are drooling over beautiful, clutter-free countertops and stealth storage options. De-cluttering has always been on the top of every real estate agent's 'home sale prep' guide, and it looks like this year's design trends will make that item even easier to check off your list. To give your kitchen a little more interest while still keeping the counters clean and clear, add little colorful or warm wood/brass toned features here and there throughout your kitchen, like this patterned tile behind the peninsula cabinets, the floating wood shelves and the brass base of the wall sconces on either side of the range hood. This keeps with the peaceful and clean aesthetic, without making the kitchen feel to stark or sterile. 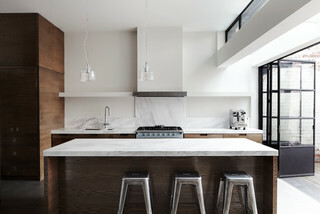 Black hardware on an all white kitchen can give some contrast without overpowering. Forgo upper cabinetry to give even your walls that clean, white, clutter-free feeling. this kitchen combats any feeling of starkness with stainless steel barstools and range hood, black steel doors (**drool**) and warm wood tone lower cabinetry. Quartz came in as the most in-demand countertop material, with granite continuing its three-year decline in popularity. Quartz is made of natural stone, but is processed in a way that makes it non porous and gives it extra strength. Granite is a completely naturally occurring stone. There are positives and negatives for both materials: granite is very durable and you can set scorching hot pots and pans directly on the counter without fear, but it needs to be sealed every couple years. 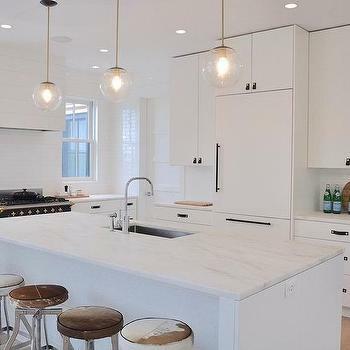 Quartz is maintenance-free and can be cut to any length (no need to buy an additional full slab of stone if you just need one more foot of counter) but hot pans can leave burn marks. Do you have either of these countertops in your kitchen? Clever—and stealthy—storage options also topped homeowners’ list of renovation must-haves. A pullout drawer to hide the unsightly recycling and waste bins, cabinet dividers for baking sheets and cutting boards and spinning shelves (“Lazy Susan”) for corner cabinets help to keep the kitchen clutter-free with essentials still easily accessible. Did you remodel your kitchen last year or are you planning a renovation this Spring? How do your choices align with the Houzz findings? Share your thoughts or ideas in the comments!